Do you have a wedding or Handfasting coming up soon? Do you need party favors for a special event? Here's an idea, why not give them a 3" pin or magnet broom or use the pin broom on your groom and groomsmen as a boutonnire. 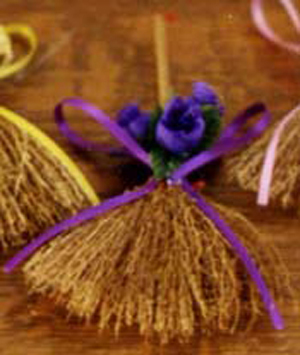 We have a Custom Made Broom Favor Quote Form for you to fill out and send by E-Mail. This form asks you all the important questions needed to give a Quote. We have an array of Ribbon Colors and Flower Colors. You can also use them to add a little color to your clothes, purse, backpack or use them in your kitchen as magents for your important papers. You can also give them as gifts! Contact us for large quanity discounts and special colors.